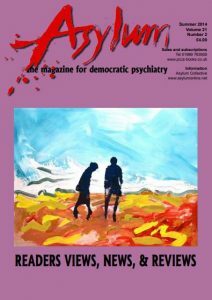 Four of the last five issues were given over to one particular theme or another, and they were usually put together by a group of people who wanted to highlight a particular aspect of psychiatry or their response to it. some of the space. It seemed to us that readers would be interested in various newsworthy developments over the last year or so. If there has been one particular worry everyone shared recently, it is probably ‘the cuts’. As soon as they were mooted, and then brought in, many people predicted the short-sighted effects of indiscriminately cutting budgets for mental healthcare. In the past year or so the evidence has started to come in about exactly how much damage is being done. And it seems that the psychiatric and mental health services are visibly and significantly deteriorating. As predicted, this is proving a false economy because – if they won’t just crawl away and die – the pieces of desperate or distressed people’s lives still have to be picked up. On the other hand, there was often not much to say for psychiatry and mental healthcare even before the cuts. We publish a number of pieces that address the various ways in which psychiatry and mental health care always did fail, anyway. But don’t be downhearted, there are even more articles here that shine a ray or two of sunny hope. I won’t spoil it for you by telling you which bits I mean. Dip in and you might be surprised!